You must have heard the idiom that “a picture is worth a thousand words.” While that is true, sometimes a picture hides a much more meaningful story than it actually shows. This means that it can cause greater sadness and deeper emotions when the story behind it is revealed. There have been many cases in history where people searched for the story behind a photo and were amazed at what they discovered. Smiles Tv collected 20 photographs that might bring tears to your eyes. Clara Gantt had been waiting for 60 years for her husband to come back home from the Korean War. Joseph E. Gantt was a sergeant and went missing while in action and his remains were found and returned to his wife in December of 2013. Clara was still mourning the loss of her husband, 63 years after he left for the war. 2. Mourning the loss of his son during 9/11. 9/11 is one of the most heartbreaking days in the history of the United States. 2,996 people died, including 19 hijackers. This man, Robert Peraza, is seen here kneeling in front of his son’s name, paying his respects. As sea ice melts in the Arctic, polar bears have to go to the land and search for food. This one was taking a walk when she saw an open window and looked inside. She was very friendly and after Paul Nicklen took her photo, she continued on her way. 4. The last male white rhino to ever live. On March 19, 2018, Sudan, the last male Northern white rhino died in the hands of wildlife ranger Joseph Wachira. He lived a long and healthy life in the conservancy after he was brought from a safari in Kenya. He died of age-related complications and his last minutes were very peaceful, surrounded by people who loved him. 5. Sleeping next to him for the last time. LT. James Cathey was killed by an explosion in Iraq. 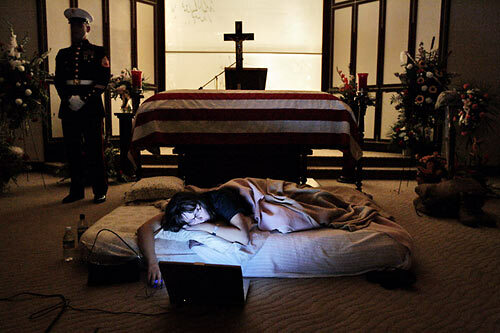 His wife, Katherine Cathey, was pregnant at the time and she requested to sleep next to his casket. Her wish was granted and during the night, she played her and her husband’s favorite songs. A US Marine, who remains unidentified, was photographed feeding a baby kitten who had lost its mother. The photo was taken after a heavy mortar barrage near Bunker Hill during the Korean War. Yusuf takes care of Kilifi, a young black rhino, who was already an endangered species from 2013. At that time, Kilifi was one of the 4,500 remaining black rhinos and Yusuf made sure that he was protected and safe. This polar bear mother was photographed from a very close distance nursing her cubs. She would sleep for some time and then wake up to feed her little ones. She was so weak that she leaned her head in exhaustion as they would be nursing. She always stayed near the water since she needed to hunt for seals. Katie Stubblefield was once in a very dark place and she shot herself in the face in an attempt to end her life. After 3 years of waiting for a face transplant, the grandmother of Andrea Schneider decided to donate her grandson’s face. After 31 hours in surgery, Katie was given a new face, but her recovery still had a long way to go. Naomi works at the Reteti Elephant Sanctuary, the only elephant sanctuary in Africa that is run by the community. Nadasoit shows her love to her protector and has now grown to be strong and protects the little ones while comforting those who are sad. She also teaches the little ones how to do many adult life things and protect themselves from possible dangers. Thania Sayne was pregnant with her second child when her husband died in the Afghanistan War. In this picture, she’s crying on his grave the day before their third wedding anniversary. 2 years after his death, she revealed that she still didn’t know how to tell her young boy that his dad wasn’t coming back home. Cristina Maria Cesario Santana was one of the many people who died during the 2011 catastrophic landslides in Brazil. Her dog is photographed here laying on her grave for the second consecutive day at a cemetery near Rio de Janeiro. After 65 years of separation, North Korean and South Korean families were reunited in August 2018. Red Cross officials gave lists of families to be reunited and this man’s name was one of them on these lists. At this moment, he had already met his family again and was heading back to his home. Men, women, and children would be undressed by SS officers and put in gas chambers. After a certain number was locked in, the officials would release the Zyklon B gas, which would slowly start to poison the people. This image shows the nail scatches that people left on the walls in an effortless attempt to escape. The 2011 tsunami that struck Japan reported a total of 15,896 deaths. In this photo, the unbelievable actually happened when a man was reunited with his pet dog after they lost each other during the catastrophe. 16. Migrants try to stay afloat after their boat was destroyed near the coast of Malta. 134 immigrants were on a boat when it started sinking. The NGO Migrant Offshore Aid Station (MOAS), which is based in Malta, rescued all of them and got them to safety. One of them was in particular agony (you can see only his hand), since he probably didn’t know how to swim. The photographer screamed to alert the rescue specialists, who rushed to pull him from the water. 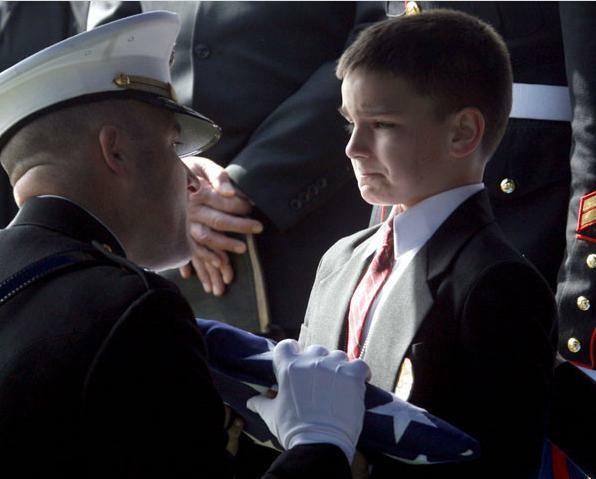 This 8-year-old boy lost his father at war and in this picture, you can see him trying to hold back his tears when being given the American flag that would be laid upon his father’s casket. The picture went viral and is usually shared again and again during American patriotic holidays, including Memorial Day weekend. Omaira Sanchez was a 12-year-old girl who was trapped for 3 days in mud, water, her dead relatives, and the debris of her house after the Nevado del Ruiz volcano in Colombia erupted in 1985. The photo was said to be taken only a few minutes before the girl died of a heart attack. Many people criticized the photographer for not doing anything to save the girl. The photo was published a few months after her death. Diego Frazão Torquato was just a poor Brazilian child who saw his life come around when his teacher taught him to play music to escape the violence and poverty through his talent. In this image, this child is playing the violin at his teacher’s funeral. In 2004, a massive earthquake hit the Indian Ocean, which resulted in gigantic waves that struck the west coast of Northern Sumatra more than any other place in Thailand. In this picture, the waves caused by the tsunami are approaching people in Sumatra who simply don’t know what to do and how to act. Which one of these images touched you the most, if you could pick one? Please share your thoughts with us down in the comments section.